San Diego mouse exterminator by Hydrex Pest Control Co.
Characteristics Important in Control:Control is by either fumigation of structures or infested objects, or various other alternative methods that Hydrex offers. Please call our office for a free estimate. Origin: Native to the southeastern United States, and found from Louisiana to Florida and north to Virginia. 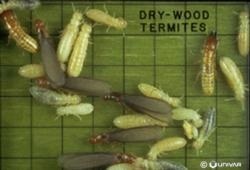 Biology: The genus Kalotermes once included all 10 species of Drywood termites, but now has a single species in it for North American termites, as the other nine species have been delegated to four other genera. Alates swarm during the daytime, usually in late summer. This species infests dead wood in outdoor settings as well as the wood of structures somewhat infrequently. Identification: Typical of the Drywood termites the alates have no fontanelle, but they do have a single ocellus next to each compound eye. The body color is dark reddish orange and the wings have a dark tint to them. The antennae have less than 22 segments. On the wings there are 3 thickened veins that run from the base to the wing tip along the leading edge, and all three veins run parallel to each other to the tip. The soldiers have a large pair of jaws protruding out in front of the head, and the jaws are not symmetrical, as they have unequal numbers of teeth or projections along their inner margin. The antennae are composed of from 12 to 13 segments, and the third segment is not at long as the fourth and fifth combined.